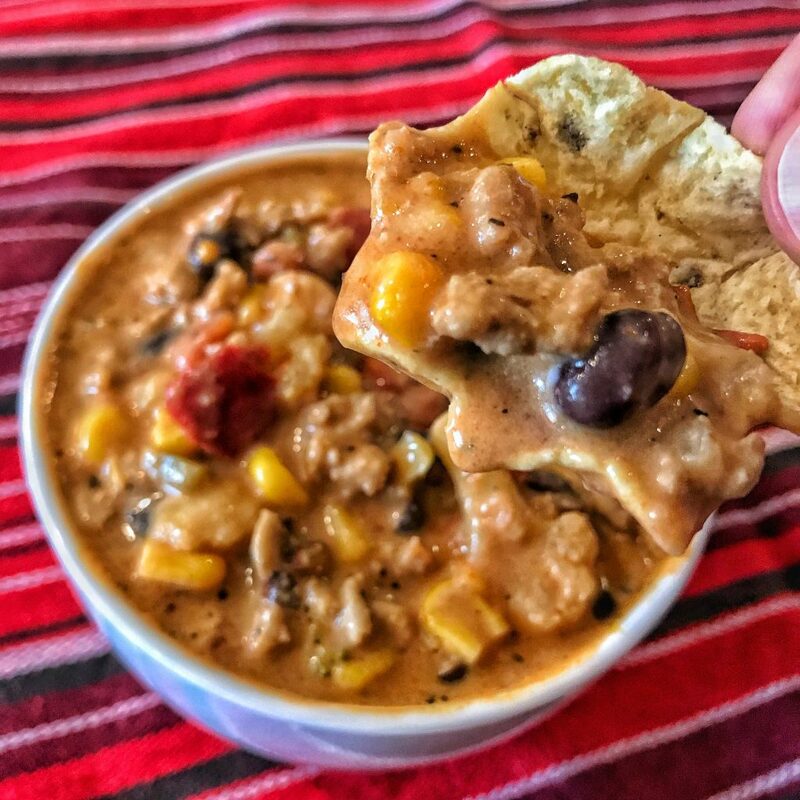 This high protein taco soup is a cool weather favorite, and it’s perfect for prepping in bulk with minimal time and effort. Another thing I love about this meal is its vast flexibility. Like any dump soup, you can add just about anything you want with minimal impact on flavor. If you don’t love veggies or have a picky eater in the house, this could be a great way to mask cauliflower, broccoli, zucchini, or other vegetables you can finely chop. As you’ll see in the video walkthrough at the end, I was fully prepped and cleaned in less than 20 minutes. If you include the simmer and packaging time, you’ll need around 30 minutes total. Brown your choice of meat on medium-high heat. Drain and rinse fat 3/4 way through cooking. Use 1 packet of taco seasoning to prepare meat as you normally would for tacos. Add all canned ingredients, cauliflower and broccoli, cream cheese, Greek yogurt, and remaining seasoning packets to a large pot. Bring mixture to a boil before reducing heat to low. Stir often to avoid scorching. Add meat to soup mixture and simmer on low heat for 5-10 minutes. The longer you allow everything to simmer, the more flavor you'll have. To portion this out, you can weigh your final mixture in a large bowl using a food scale. Depending on your calorie/macro goals, portion accordingly. Using the total calories (~3,300), you could portion out 16 205-calorie meals, 10 330-calorie meals, 7 470-calorie meals, or whatever works best for your meal frequency and calorie needs. Be sure to account for anything you'll add to the soup like cheese, sour cream, chips, etc. 0 Response to "HIGH PROTEIN CREAMY TACO SOUP RECIPE"